Phan Thiet tourism has long been the choice of many travelers when it comes to visiting Vietnam. In regard to this place, it seems that the first thing that impresses tourists is the sea and sand. But if you give love to Phan Thiet (Phan Thiết), you certainly will not want to miss the trip to the pristine small and peaceful island named Ghenh Island (Hòn Ghềnh) in your journey. To help you get the most out of this destination as well as give you the most detailed guidelines about traveling to Ghenh Island, we share the latest Ghenh Island travel experience below. 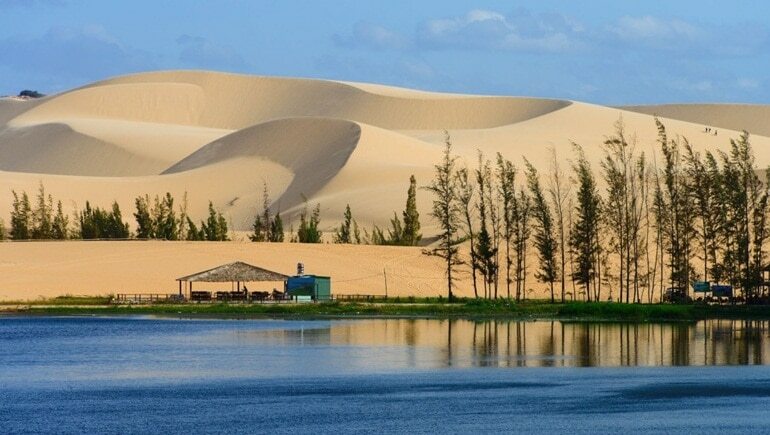 Located just less than 1 km from Mui Ne, Ghenh Island is also called as Lao Island (Hòn Lao). This island lies at about 30 meters above the sea level, and is isolated as a peaceful oasis. 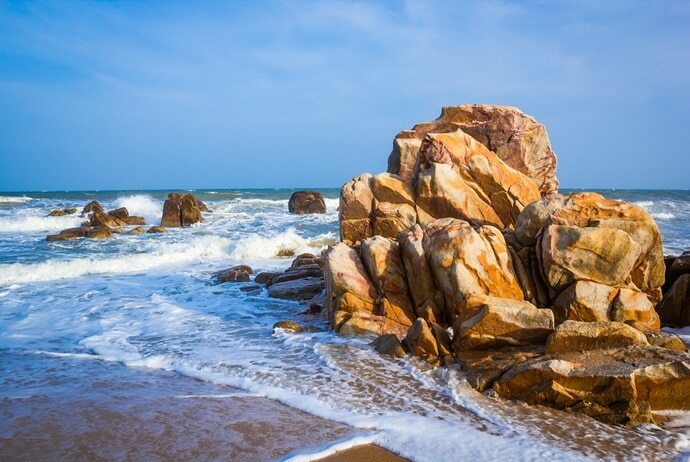 Previously, it is not named in the tourist map of Phan Thiet city in Binh Thuan province (Tỉnh Bình Thuận) because it is quite primitive and there is no person living here. Since the new resorts such as Siva and Ghenh Mui Ne were built in the back of Mui Ne (Mũi Né), Ghenh Island was targeted by tourism companies in Vietnam. Therefore, they began to take visitors to this beautiful oasis. Many visitors have the idea of linking Ghenh Island to the image of a sea turtle which is swimming. This must have inspired your curiosity about Ghenh Island’s appearance, right? Currently, this island is still a small wild island, with only rocks, sand, weeds, and waves. What Is The Best Time To Visit Ghenh Island? 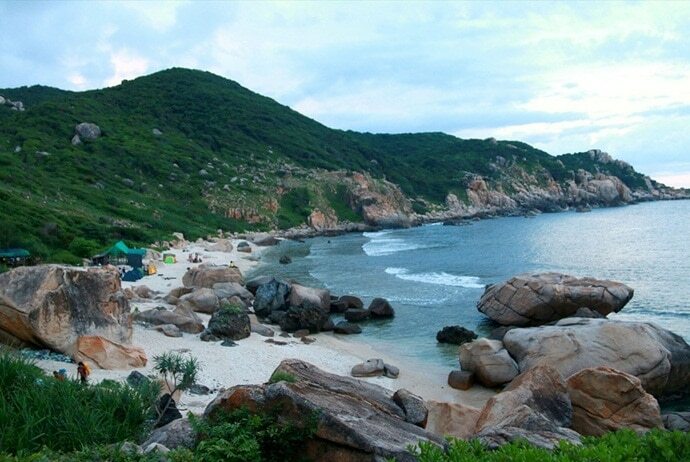 To admire the magnificent beauty of Ghenh Island, you should come here in the afternoon. At this time, you will see the sunset on the sea. Early morning is a good time for fishing enthusiasts. If you are lucky enough, you will be able to catch big fish. In particular, this area has many sea cucumbers lying hidden in the rocky slits. If you are not afraid of them, you can catch them to prepare dishes for your picnic. Mr. Ngo Minh Chinh (Ngô Minh Chính) – The Director of Binh Thuan Food Company and also the owner of Siva Tourism Village – said that the construction of the wharf, tents and fishing places will be set up soon to make Lao Island become a picnic – ecotourism for visitors when visiting Siva. How To Get To Ghenh Island? To reach Ghenh Island, you can go in two ways, take the shuttle service from the village of Siva resort or rent fishing boats at Mui Ne with round-trip ticket about 20.000 VND / boat/person (10 people / boat). From Mui Ne (Mũi Né), the boat goes about 10 minutes to get you to the island. 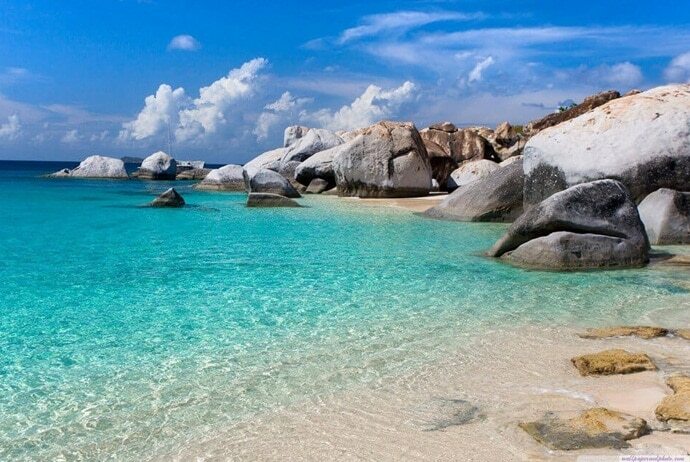 The first impression here is clear sea water and beautiful coral reefs. Around the island, there are large rocks stacked on top of each other. You have to cross them to climb up the top of the island. What Are Attractions In Ghenh Island? Not everyone can really feel and love the scenery in Ghenh Island, except for those who are romantic and adventurous. Romantic people can sense the sea scene which is full of poetry. Just a light wind or a small whirlwind suddenly pushing the dust layer can make them feel touched. 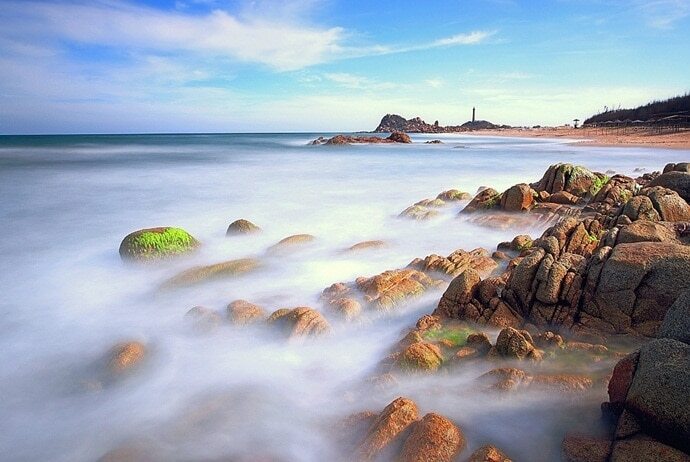 For those who like to explore the experience with adventures, Ghenh Island can also be classified as one of the ideal destinations.Although the height of the island is not too impressive, the rocky ridge of provocative will surely blow passionate conquest of visitors. When arriving here, many visitors are amazed at the beauty that nature has given this place. Large and small rocky cliffs overlap each other, creating stone blocks and small caves with beautiful and strange appearance. Because there are many oysters living in the rocks and their shells are very sharp, you need to be careful not to touch them. One more thing that impresses visitors is that the water here is very clear and cool. Visually, visitors can also see the colorful coral reefs at the bottom of the sea. An enormous sight with the blue sea and yellow sand embraces the waves fluttering to the shore, creating a wonderful scene. Climbing to the top of Ghenh Island, all difficulties will dissipate, giving way to the feeling of victory. From here, visitors can enjoy the most beautiful scenery under the immense of the sky. From the top of Ghenh Island, visitors can see the vast sea and enjoy ocean breeze. One side of the island is Mui Ne, and the other is Rom Island (Hòn Rơm). They form arcs as arms embracing the sea. Many people say that, thanks to the protection of Rom Island and Mui Ne, Ghenh Island is a jewel of the sea. Until now, Ghenh Island is still a wild oasis. There are only wild plants, rapids, rocks and many species of birds. No one lives here. There is only one shrine dedicated to Nam Hai which is worshiped and cleaned by fishermen. What To Eat In Ghenh Island? 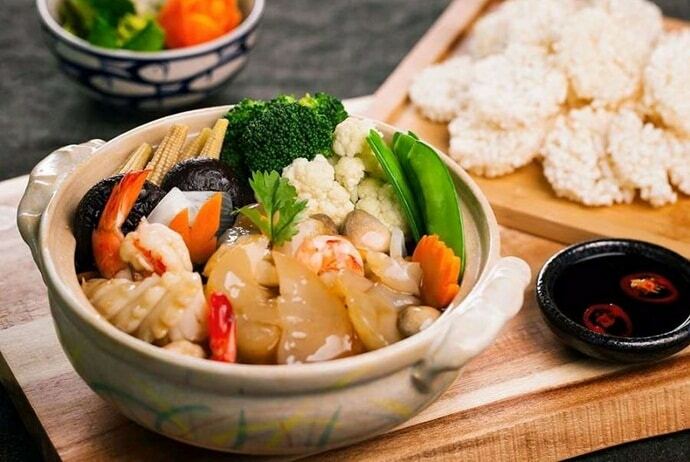 As we mentioned above, Ghenh Island has a lot of sea cucumber, so if you have a chance to visit here, do not miss the delicious dishes made from sea cucumber. Since this place is so wild, it is difficult for you to find a restaurant. Therefore, before you go, you should bring water and fast food. If you intend to process the sea cucumber right on the island, don’t forget to bring your cooking utensils. There, we have just introduced to you the travel experience of Ghenh Island to help you have the most enjoyable trip. Many visitors comment that the island’s pristine nature has become a magnet for anyone who is interested in exploring natural wonders. Therefore, when visit Phan Thiet – Mui Ne, do not hesitate to arrange a trip to Ghenh Island to experience the wonderful feeling. Finally, if you have any questions or other experiences to share, leave a comment below. Wish you have a fun trip in Ghenh Island, Vietnam!